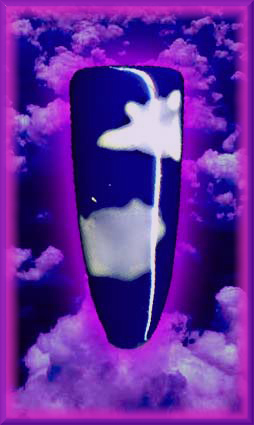 Clouds Illusions Gel Nail Art: Apply two coats of Beguiling Blue gel nail polish to entire nail plate. Cure for 10 seconds. Using French White gel nail polish, paint on cloud formation. Cure for another 10 seconds. Apply Hyper Finish nail gel for a smooth finish. Cure for 1 ½ minutes.